The recent controversy over Barney Frank accusing Log Cabin Republicans of being “Uncle Toms overlooks some important historical facts. Those facts are significant because his overlooking them reveals a lack of understanding of the differing contexts of oppression of LGBT people and people of color, particularly African Americans, that is widespread in the primarily white LGBT movement. But first, as a gay man, I gotta give it to Mr. Frank. Log Cabin Republicans (called that in deference to Lincoln) are worthy of criticism. I may, like Mr. Frank, disagree with Republicans who happen to be LGBT, but I have the most profound disrespect for LGBT Republicans who serve as apologists for Republican bigotry. But to call them “Uncle Toms?” That was just wrong. Uncle Tom is a reference to a character in a Harriet Beecher Stowe novel, Uncle Tom’s Cabin, written in 1861, before the abolition of slavery. In the story, Tom is beaten to death by his master for refusing to expose the locations of two fugitive slave women. Many have criticized Stowe for her characterization, which presents Tom as saint-like, both for his servility, and his refusal to fight back. And there’s no doubt that Uncle Tom is two dimensional character. He’s subservient in the extreme, and his passivity in the face of injustice made the term “Uncle Tom” into an epithet over the years, especially during the Civil War when it was used by some to refer to African Americans who stayed in servitude after abolition and therefore (forcibly, it is assumed) helped the Confederate war effort. But whatever he is, both as a literary character and a historical trope, Uncle Tom is not equivalent to Log Cabin Republicans. 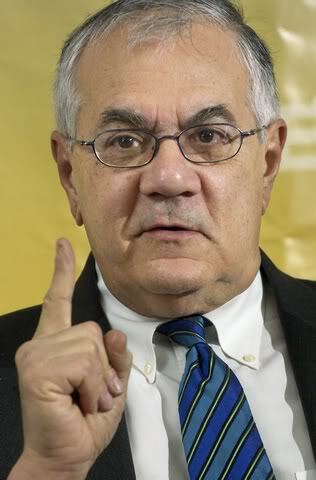 Before speaking, Barney Frank should have considered the context of slavery out of which the character Uncle Tom comes. He was not voluntarily in the service of his master as are Log Cabin Republicans. Volition was something slaves were denied. Moreover, Uncle Tom’s real life equivalents didn’t profit by their support of their masters. Slaves were property. According to the logic of slavery, they were nothing more than units of production. When they didn’t work, they were “fixed” through terrorism and violence, and when they wore out, they were discarded. Women were regularly raped, and men sometimes castrated at the whims of their masters. Under such circumstances, a servile attitude is a form of self-defense. This survival strategy is not to be compared to Log Cabin Republicans whose agenda is more like self-aggrandizement. And after the Civil War that Stowe’s Uncle Tom’s Cabin is often said to have helped start, Blacks in the South were subjected to neo-slavery, campaigns of terror, lynching, segregation, and humiliating circumstances of labor. To the degree that some of the most egregious offenses against Black people were stopped during the 1940s and 50s (even as others were initiated), it was to a large degree in order to address the public relations needs of the U.S. Cold War strategy to which the mistreatment of Black people was a liability internationally. Using the term “Uncle Tom” to denigrate Log Cabin Republicans minimizes the history out of which the term came to us. It sanitizes the past by suggesting a contemporary equivalency between the subservient attitudes of people terrorized by slavery and the obsequiousness of conservative LGBT people who, moreover, are on the wrong side of the current fight to address the legacy of injustice of slavery that we live with today. And politically speaking, it fails to see the differences between the struggles of LGBT people as a sexual minority community (since obviously we aren’t all white), and other communities of color, and that does us no favors. It is in those differences that important strategies for addressing the different ways we are oppressed often exist, and the acknowledgement of those differences is vital to demonstrating the kind of understanding and respect necessary to building bonds of authentic solidarity. I have always loved Barney and been grateful for his personal/political personae, but as a woman, a Black person, and as a lesbian, I agree that Mr. Frank needs to be called out on this one! Michele Bachmann’s “happy slaves” and the sanitization of Huckleberry Finn were bad enough, buy this type of white-washing, self-serving, selective memory is simply intolerable. This has been an issue between the white and Black lgbt communities for decades. Thank you for what you’ve said, and for saying it so eloquently and incisively! Bravo/a!! If he was searching for a colorful quasi-historic metaphor to liven up his otherwise very justified take-down, he could have just used “Stockholm syndrome”. Not quite the same, but I think it was all for effect anyway, so why be picky. Precise people value precision. You, apparently, do not. It strikes me as disingenuous, and callous, to play ‘fast and loose’ with the reality of other people’s pain in order to seek relief for one’s own pain. And in this case, it’s comparable to referring to indigestion as… esophageal cancer. For the most part, Log Cabin leaders are basically privileged white cis men who happen to be gay (if there are lesbian or trans leaders of the LCR, I haven’t seen them). That’s all. These guys identify their interests with the ruling class, not with other LGBTQ people. Forget Rainbow Pride—it’s all about them dead presidents. Their sellout actions have nothing to do with Uncle Tomism or “Stockholm syndrome” (a pop psychology term that’s way overused anyway). The LCR’s shilling for the GOP is all about power and privilege, period.